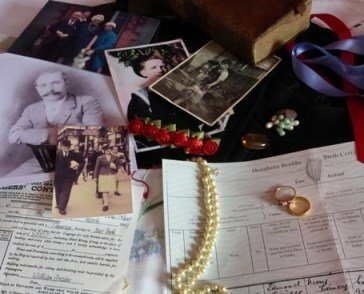 Family history stories revealed through the memories of your relatives bring a level of colour and detail to your genealogy research that you won't find elsewhere. Don't miss any opportunity to explore such memories, but do get yourself organised in advance. 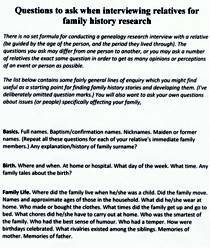 There is no one-size-fits-all set of questions to ask in family history research interviews with relatives; be guided by the age of the person, and the period they lived through. The questions you ask may differ from one person to another, or you may ask a number of relatives the exact same question in order to get as many opinions or perceptions of an event or person as possible. You will also want to ask your own questions about issues or people specifically affecting your own family and ancestors. Basics. Full names. Baptism/confirmation names. Nicknames. Maiden or former names. (Repeat all these questions for each of your relative's immediate family members.) Any explanation/history of family surname. Birth. Where and when. At home or hospital. What day of the week. What time. Any family tales about the birth. Family Life. Where did the family live when he/she was a child. Did the family move. Names and approximate ages of those in the household. What did he/she wear at home. Who made or bought the clothes. What times did the family get up and go to bed. What chores did he/she have to carry out at home. What kind of illnesses did family members experience. Was anyone seriously sick or incapacitated. Who was the smartest of the family. Who had the best sense of humour. Who had a temper. How were birthdays celebrated. What rivalries existed among the siblings. Memories of mother. Memories of father. The home. Apart from the main living areas, were they any outbuildings. Was the home connected to electricity and water supplies. Where was the bathroom. Where did he/she sleep. When did the family eat. What did they eat. Did the family eat together. Favourite/least favourite meals. What meals were typical of Christmas. School. When did he/she start school (age). First impressions. What did he/she wear at school. When time of day did school start and finish. How did he/she get to school. What did the children eat at lunchtime. What subjects were studied. What sports were played. What were the teachers like. What methods of discipline did teachers use. Who were her/his favourite teachers. What games were played in the playground. What age did he/she finish school. Any surviving school reports or certificates. What level of education attained. Favourite subjects. Most disliked subjects. Happiest/saddest memories of schooldays. Leisure time up to adulthood. Was he/she a member of any clubs/organisations/sports teams/bands or choir. What were his/her hopes and dreams as a child/young adult. What were his/her friends like. What did they get up to (that they shouldn't have got up to!). What were his/her happiest memories of childhood/teenage years. Did he/she attend a church as a youngster. Which one. Where was it located. How did you get there. Did all members of the family attend. Earlist recollections of church services. Who was the priest. What did he/she wear for first communion/confirmation. What recollections does he/she have of these events. Did all the family attend. Marriage. Did he/she have any other boy/girl friends before they married. How did he/she meet the future spouse. What was he/she wearing. What was the main initial attraction between the two. Memories of the proposal. how long was the engagement. Where did he/she spend the night before the wedding. Where was the wedding held. Who attended. Who were the witnesses. Whad did the groom wear. What did the bride wear. What memories of the wedding day. Did they have a honeymoon. How did he/she adapt to married life. Parenthood. When did he/she find out that the first baby was on the way. How did he/she feel at this news. Why did he/she choose the children's names. How did he/she adapt to parenthood. How did he/she manage work and parental responsibilities. What was he/she like as a parent. What was the spouse like as a parent. Employment. What career had he/she imagined as a child. What was his/her first job. How did he/she land the job. Memories of first day at work. What were the best/worst features of the job. How long did he/she stay in the first job. Recollections of colleagues. How much was the pay. What could that amount buy at that time. How many hours were worked. What were the start and finish times. Was there a lunch break. What was eaten at lunchtime and where. How did he/she get to and from the workplace. Major events. What major events occurred during his/her life. How did these impact on his/her life at the time. Or over the longer term. When you're diggiing deep in the hope of discovering tales of your ancestors, it can become difficult to keep track of your interview if you are taking written notes. Unless you use shorthand competently, you'll find it impossible to write down everything you're told, and even then, it can be hard to keep the interview flowing when you have to concentrate on your note-taking skills. One of the biggest dangers is that you'll miss or fail to write down an aside, or an off-the-cuff comment that could lead to a vital clue. This is why recording your interview (and making a few written notes as well) is a much better option for exploring your relative's memories. You won't miss that all-important clue; you can be more attentive to the thread of the conversation; and, vitally, you can look at your relative and spot or follow-up any non-verbal signals. The latter are often tell-tale signs that are worth remembering or noting in writing, or even following up with a carefully worded question. Another reason for choosing to record is that it gives you the chance to make eye-contact with your relative. If you are writing things down, you can't maintain that level of involvement. This can make finding family history details awkward for you both. The recording equipment you use doesn't have to be fancy or expensive. You should be able to buy a small and unobtrusive digital recorder fairly cheaply, but check the maximum recording time with these. Some are less than 30 minutes, which won't be much good to you. There are also simple gadgets you can attach to your phone socket to record telephone interviews to a digital recorder. In some countries it is illegal to record a telephone call without telling the other party. In other countries it is legal provided the recording is not played to a third party without consent. Safest option is simply to tell your relative up front if you are going to record the interview.